Voltage Unbalance (or Imbalance) is defined by IEEE as the ratio of the negative or zero sequence component to the positive sequence component. In simple terms, it is a voltage variation in a power system in which the voltage magnitudes or the phase angle differences between them are not equal. It follows that this power quality problem affects only polyphase systems (e.g. three-phase). Voltages are rarely exactly balanced between phases. However, when voltage unbalance becomes excessive, it can create problems for polyphase motors and other loads. Moreover, adjustable speed drives (ASD) can be even more sensitive than standard motors. 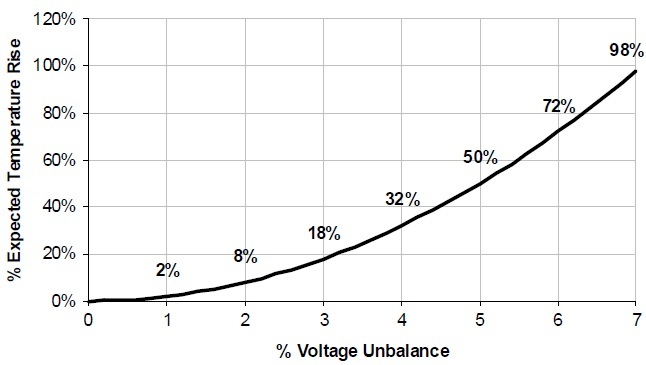 Voltage unbalance is primarily due to unequal loads on distribution lines or within a facility. In other words, the negative or zero sequence voltages in a power system typically result from unbalanced loads causing negative or zero sequence currents to flow. The utility can be the source of unbalanced voltages due to malfunctioning equipment, including blown capacitor fuses, open-delta regulators, and open-delta transformers. Open-delta equipment can be more susceptible to voltage unbalance than closed-delta since they only utilize two phases to perform their transformations. Also, voltage unbalance can also be caused by uneven single-phase load distribution among the three phases - the likely culprit for a voltage unbalance of less than 2%. Furthermore, severe cases (greater than 5%) can be attributed to single-phasing in the utility’s distribution lateral feeders because of a blown fuse due to fault or overloading on one phase. The facility housing the motor can also create unbalanced voltages even if the utility supplied voltages are well balanced. Again, this could be caused by malfunctioning equipment or even mismatched transformer taps and impedances. Similar to the utility, poor load distribution within the facility can create voltage unbalance issues. The motor itself can also be the source of voltage unbalance. Resistive and inductive unbalances within the motor equipment lead to unbalanced voltages and currents. Defects in the power circuit connections, the motor contacts, or the rotor and stator windings, can all cause irregular impedances between phases in the motor that lead to unbalanced conditions. Unbalanced systems indicate the existence of a negative sequence that is harmful to all polyphase loads, especially three-phase induction machines. The main effect of voltage unbalance is motor damage from excessive heat. Voltage unbalance can create a current unbalance 6 to 10 times the magnitude of voltage unbalance. In turn, current unbalance produces heat in the motor windings that degrades motor insulation causing cumulative and permanent damage to the motor. This scenario would result to expensive facility downtime due to motor failures. The graph below shows the relationship between voltage unbalance and temperature rise, which approximately increases by twice the square of the percent of voltage unbalance. Voltage unbalance can be estimated as the maximum deviation from the average of the three-phase voltages divided by the average of the three-phase voltages, expressed in percent. Assume the following phase-to-phase voltage readings of 226, 231, and 233. For the utility, it is just a matter of repairing malfunctioning equipment or redistributing loads to reduce the unbalance. For the end-users, proper testing and communication with the utility would help locate and resolve the problems. Adjustable speed drives can be equipped with AC-line reactors and DC link reactors to mitigate the effects of unbalance. Depending on how the ASD is configured with AC and/or DC reactors, both the magnitude of RMS currents and the percent of current unbalance can be potentially reduced. Nonetheless, before applying reactors to an ASD, the drive manufacturer should be consulted. It is usually more cost effective to request reactors at the time of equipment purchase. Additional benefits to applying reactors to an ASD include improved power factor, harmonic mitigation, and protection against transients. Furthermore, motors can be derated to reduce the likelihood of damage. However, derating a motor is one of the least desirable methods for dealing with voltage unbalance, because the unbalance situation still exists and the motor cannot operate at its full potential. Typical derating factors for motors as per NEMA MG-1 are shown below. Also, motor manufacturers should be consulted to find the specific derating factor of the motors. Meanwhile, most utilities in the United States restrict the voltage unbalance to 2.5% maximum deviation from the average voltage between the three phases. On the other hand, the National Equipment Manufacturers Association (NEMA), only requires motors to give rated output for 1% of voltage unbalance per NEMA MG-1. By limiting voltage unbalance to 1%, this is more stringent than either ANSI C84.1 or most utility guidelines. Moreover, some motor manufacturers have tried to require less than 5% current unbalance for a valid warranty. NEMA MG-1 states that 1% of voltage unbalance can create 6-10% current unbalance. Therefore, these motor manufacturers have requirements that are potentially more restrictive than NEMA MG-1. These differences result to confusions between the utility, manufacturers, and the end-users. Thorough assessment should be made in each location to the utility’s criteria and the manufacturer’s guidelines. Dugan, R., McGranaghan, M., Santoso, S., and Beaty, H.W. (2004). Electrical Power Systems Quality (2nd ed.). New York: McGraw-Hill. IEEE 1159-1995. Recommended Practice For Monitoring Electric Power Quality. Hi, this is Mark from the Yorhoo blog. Just wondering if you'd like to exchange blogroll links with us. I am a Professional Electrical Engineer with a Masters Degree in Business Administration. My interest is in Power Quality, Diagnostic Testing and Protective Relaying. I have been working in an electric distribution utility for more than a decade. I handle PQ studies, power system analysis, diagnostic testing, protective relaying and capital budgeting for company projects. DISCLAIMER: Some of the links, content directing to links, videos, images and other references are not owned and is not stored on the site. If you feel that we need to remove any of those aforementioned elements, feel free to inform the administrator of the site.